Years before writing “It Had to Be You” and “I’ll See You in My Dreams,” Isham Jones honed his craft at Mann’s Rainbo Gardens in Chicago—composing, arranging, and perfecting songs that he and his band performed nightly before the dinner-and-dance patrons. Jones’ style, capturing elements of the social dance craze of the 1910s and anticipating the jazz revolution of the 1920s, offers a rare glimpse into the beginnings of the era of great American dance bands. This two-CD set presents remarkable restorations of all 37 sides Jones’ Rainbo Orchestra recorded in 1920 and includes a 32-page booklet, with notes by Grammy-nominated author and trombonist David Sager, exploring Isham’s earliest years, his gift for tuneful arrangements, and his importance as an architect of the American dance band. Born in 1894 and raised in Saginaw, Michigan, Isham Jones showed his musical proclivity at a young age, even publishing his first composition by the age of 14. He played fiddle, piano, saxophone, and string bass. Two accidents—one of little consequence while he worked in a coal mine, the second a serious one while he was in the National Guard that fractured both his legs—told Isham that a career in music was the path he needed to follow. He left Michigan in the mid-1910s and headed to the Midwest. Jones’ reputation quickly became established. By 1918 he was directing an orchestra at the Green Mill Gardens on the north side of Chicago, and in 1919, The Gumps, for which Jones wrote the music, became a national hit show. Jones was now lured by impresario Fred Mann to headline at his new Rainbo Gardens, and the rest, as they say, was history. The bandleader, songwriter, and arranger would begin a period of musical dominance that would last for nearly two decades, starting with his first recordings, made in 1920. Taking the band to New York in June 1920, Isham Jones and His Rainbo Orchestra set up at the Brunswick studios and recorded their first 14 sides, issued on the new label’s “celebrity series,” which bore the distinctively attractive purple labels so beloved today. The band consisted of Jones (C-melody and tenor sax), Carroll Martin (trombone), Leo Murphy (violin), Alfred Eldridge (piano), Charles McNeill (banjo), John Kuhn (tuba), and Joe Frank (drums). Fellow midwesterner and Brunswick executive, Gus Haenschen (aka “Carl Fenton”) sat in on a couple of numbers playing a second piano, as on “Jean.” Standouts include “Sahara Rose” and its bold minor verse; the jaunty pairing of “Wait’ll You See” and “When Shadows Fall I Hear You Calling, California”; “Scandal Walk,” with its chord-shifting “blue” effect; “Kismet,” featuring Martin’s trombone pyrotechnics; “La Veeda,” sounding more beautiful than you’ve ever heard it; and, of course, “Happy,” which speaks for itself. The initial releases were received very well, and Brunswick invited Jones back for more sessions. Adding R. N. Putnam (alto and soprano sax), the band went back to New York in October 1920 to do another nine sides. “Japanese Sandman” conveys more zip and energy than the hit versions by the orchestras of Paul Whiteman and Art Hickman. Two Jones numbers, “Sweet Woman” and “Wishing,” appear, demonstrating his ability to produce simple, catchy tunes, while two others—”Dreamy Paradise” and “Jing-Bula-Jing-Jing”—capitalize on the fading Hawaiian craze, the former up-to-date with a prominent ostinato figure (a là the smash hit “Dardanella”). Another three sides—”Avalon,” “Fair One” and “Sultan”—seem to have been made in late October 1920, when the band added a second (unidentified) violin to the mix. They would return to New York for final work under the current lineup in December 1920. The Brunswick labels for these final 11 sides simply say “Isham Jones Orchestra,” but it’s the same personnel as on the Rainbo sides. An unknown trumpet (or cornet) is added, but this is not a lead trumpet, as would be the case when Louis Panico would join the band in 1921 and take it in a different direction. Instrumental versions of popular songs get treatment in this set, including “Look for the Silver Lining,” “Make Believe,” “All She’d Say Was ‘Umh -hum'” and “My Mammy.” Toward the end of the set you’ll notice the Jones outfit conceding to some of the trends (or parodies) in jazz, the avoidance of which hitherto had marked Jones as unique. For instance, the trumpet starts to lead on “Underneath Hawaiian Skies,” and the trombone smears all over the place on “Siren of a Southern Sea.” By the way, “Siren,” the final number, is the only selection on the set that was not paired with another Jones performance on its original Brunswick release (# 5059). 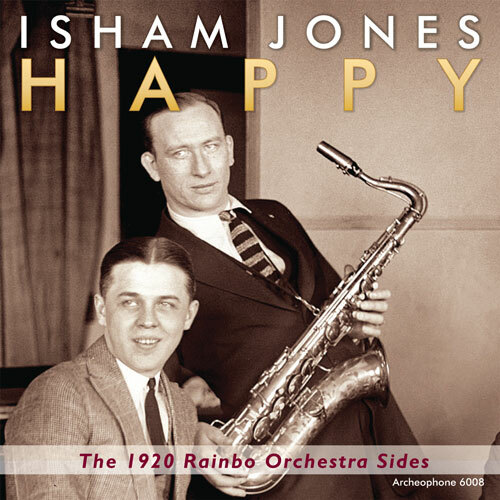 With one foot in the past of polite social dancing, and one foot in the new world of jazz, Isham Jones’ Rainbo sides have long puzzled connoisseurs of early, hot dance-band recordings. This is why the recordings have been overlooked: the experts haven’t known what to do with them. Our essayist, trombonist and jazz historian David Sager, fixes that; he has a keen appreciation for the development of musical styles, and in 32 pages he lays out a very convincing case for the historical importance of the Jones Rainbo outfit. Full of lively and tuneful melodies played by virtuosic performers, and arranged in a style that invited dancers rather than estranged or confused them, Jones’ first 37 sides demonstrate his deep, blue-collar work ethic and his commitment to precision and excellence. You’ll think you were back in Chicago in 1920. And you will be happy! ...Jones and company were situated between musical past and present, borrowing ideas from jazz while employing a relatively conservative repertoire and retaining the old-world presence of violin. Jones became a dominant figure in Chicago nightlife in the 20s and 30s (he's best-known to the world at large as the composer of the standard "It Had to Be You"), embracing jazz more explicitly, but while these recordings are more tame, the arrangements make them stand apart from the usual white-band fare of the day. The group was incredibly precise, a product of Jones's meticulous attention to detail. In his notes Sager writes, "Ish developed an austere, unsmiling presence on the podium, conducting with a baton, looking like—in the words of Swing Era journalist George T. Simon—a 'strict manual arts teacher.'" Isham Jones is best remembered today as a significant American songwriter, the man who composed such songs as "It Had To Be You," "I'll See You In My Dreams," "There Is No Greater Love" and "The One I Love Belongs To Somebody Else." He is also known as a bandleader who in the 1920s led an orchestra that balanced jazz with dance music. When he broke up his final significant band in 1936, Woody Herman took over the nucleus. However Happy concentrates on Isham Jones' little-known band of 1920, reissuing all of its 37 recordings. Few of these performances had been reissued before and never with such impeccable sound. Archeophone's accompanying 32-page booklet is typically superb with so much information about the obscure band and Jones' earlier life. Most of these performances are played by a group consisting of Jones on tenor and C-melody sax plus the virtuosic trombonist Carroll Martin, violin, piano, banjo, tuba and drums. Occasionally a second pianist or a xylophonist is added and in the later sides there is sometimes a second saxophonist plus a second violinist. Only the last three sessions add a cornetist and his part is relatively minor. The music is essentially ragged dance music that is often quite spirited. While there are no actual solos (other than brief breaks), if one listens closely to some of the hotter selections, it becomes apparent that Isham Jones could be considered the first jazz-inspired tenor-saxophonist to be on records since Coleman Hawkins' first recording (with Mamie Smith) did not take place until 1921. Jones sometimes comes close to cutting loose while Martin's speedy trombone runs make one wonder when he caught his breath. The music is all ensembles with either the tenor or the violin (or both) taking the melodic lead. It puts the spotlight on a transitional point in music history when jazz was just beginning to affect the dance bands, several years before Louis Armstrong emerged in Chicago. This is fascinating music (available from www.archeophone.com) that vintage collectors can consider essential.